Luxury silk scarves are some of the most recognizable fashion accessories in the world, synonymous with names such as Hermès of course and famous for their iconic status, versatility and artistry. A luxury silk scarf can be a work of art but the level of craftsmanship varies and determines the quality of what you buy. But why silk in the first place and which type of silk is most suitable for a silk scarf? With the growing awareness and interest in shopping and living sustainably, the Buy Less Choose Well philosophy has encouraged us to question the true value of what we buy and how it’s made. As you know, Sustainability, Slow Fashion and manufacturing in England - with all the transparency which that entails - are all key features of Basma Design’s DNA. Many printed scarves are produced using computers and machines to create the designs. And the majority use Twill Silk or Crêpe de Chine, which is much heavier than the fine Silk Chiffon used at Basma Design. Instead of machines, I use traditional hand drawing techniques and lino prints to add the bright colours and patterns to the luxurious silk scarves. The hand-drawing technique allows for a freedom of style and mono-type print which makes each scarf completely unique. Just like you. 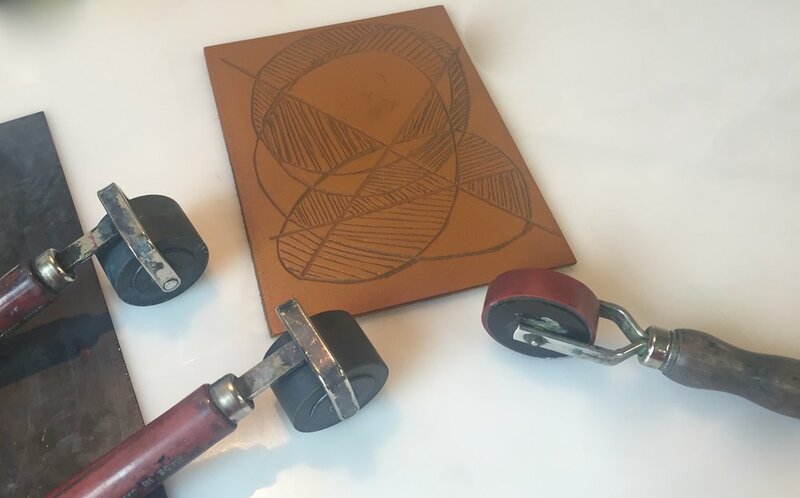 If you have ever wondered about the process of making these gorgeous pieces, read on! You can even come and meet us and see Basma Design’s luxury scarves at the curated art and design fair Handmade Chelsea, next week, from 9th – 11th November. Early on, I decided to use the very finest silk chiffon for a specific reason. Weaving art with fashion and translating unique, abstract designs into luxury wearable art, it was clear that only this ultra-lightweight plain-weave silk fabric would do. As the canvas, I can illustrate abstract, hand-drawn designs on this semi-translucent fabric, while still retaining the texture. Made from tightly twisted fibres, silk chiffon drapes well and has a sheer appearance. It also has a little bit of stretch and a slightly rough, textured feel, while feeling smoother and more lustrous than georgette silk. This whole process, including the printing, takes place in England, which is something our family at Make it British supports for hundreds of independent designers. Once the artwork has been digitally printed onto the silk drape in the factory (usually in Cheshire), the silk is then cut into squares, and seamstresses hand-roll and sew the edges finished with silk thread in a traditional technique. This hand-sewn rolled edge is one of the true markers of an authentic Basma Design scarf and will always feature a contrasting colour. You can see this really clearly with the Azurite style featured here with its golden yellow edge. 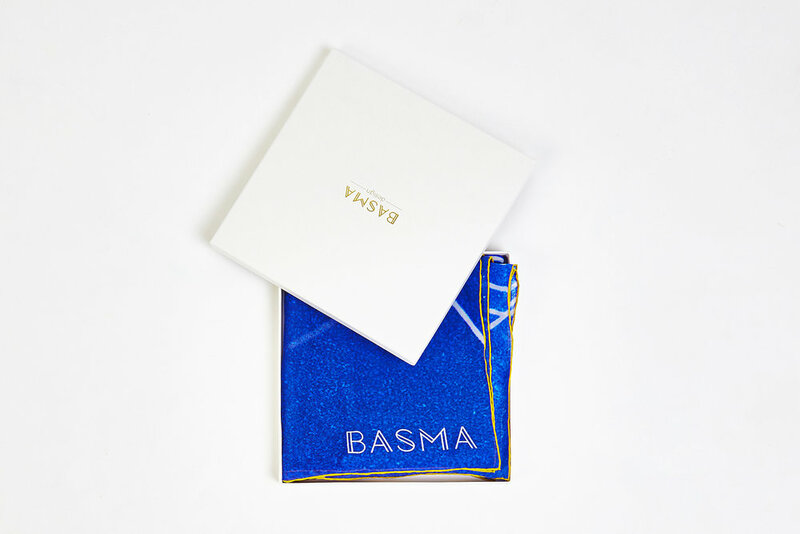 Creating one Basma Design scarf can take several months, but our customers appreciate the care and quality taken to create these luxurious accessories. Our square scarves sell for £180 (the slim scarf is £150), but when you know the hard work that goes into creating just one scarf, that price seems more than fair. You get what you pay for and shopping consciously is shopping wisely. You may even have seen some of these scarves in our recent campaigns in Vogue, Tatler and CN Traveller. So, tell us, which design is your favourite and why? Hopefully, you can see the artistry behind the designs and the true value behind timeless luxury. And one last thing. Please treat your scarf with love. Silk is a natural protein fibre and any substances containing alcohol will damage the delicate fabric. Allow perfume and hairspray to dry completely before wearing. We recommend our silk scarves are dry cleaned only. Should you wish to iron your scarf, please use a cool temperature to avoid damaging the silk. So now you know the secrets behind a silk scarf…. If you’d like to attend Handmade Chelsea then you can buy tickets from the link here. Please pop by and say hello and quote #HandmadeChelsea & #BasmaFriends for a special VIP treat towards your luxury silk scarf.